San Francisco-based Lattice, a three-year-old provider of continuous performance management software, has launched its second product, called Engagement. With it, the company said it’s become the first HCM technology vendor to combine performance management and engagement into a single system. Connecting Engagement’s survey functionality to Lattice’s performance management suite provides customers with the obvious convenience of accessing one system instead of two. But convenience isn’t the real point, said CEO Jack Altman. “We believe employee engagement and employee performance are deeply related,” he explained. Altman believes that performance and engagement form a “virtuous cycle” where each drives the other. Higher performance, he told the HCM Technology Report in an interview, leads to feeling more engaged and involved in your work. Similarly, people who feel more engaged and are happier at work are also motivated to perform at higher levels. “So there are all of these ways in which these two things become either virtuous cycles up or vicious cycles down,” Altman said. Lattice’s premise is that by linking performance to engagement on an ongoing basis, employers can get a better sense of what trends and attitudes are developing within their workforce. For example, is the engagement of top engineers decreasing over time? Has the engagement of a new manager’s team gone up? As performance changes over time, the organization can examine how engagement has changed concurrently and get a sense of why. “I think a missing link with employee engagement has been connecting it back to performance, and so our product now allows you to do that,” Altman said. Managers and HR can look at an engagement survey’s results and immediately click to the Performance product to take actions like, say, increasing the pace of one-on-ones or improving the performance-review cycle. Lattice, Altman explained, is trying to address the intersection of data and workflow so companies can improve both their levels of performance and engagement. Combining engagement surveys with performance management tools gives employers the ability to take action based on what the surveys reveal. By using the company’s Goals module, for instance, managers can help provide clarity to workers who don’t understand how their role fits into the organization’s mission. If employees don’t think they get enough of their supervisor’s time, Lattice 1:1 provides a platform where workers and managers can collaborate on deciding what issues need discussion, take notes when they meet and set next steps. 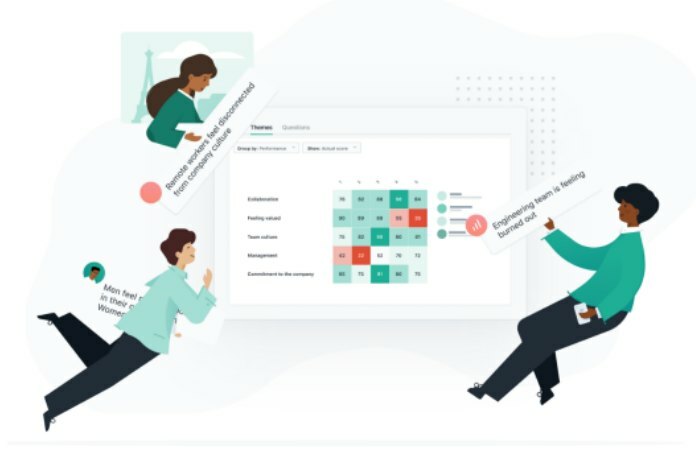 In its Performance modules, Lattice provides dashboards for managers that help them set goals and track performance on both a team and individual basis. Similarly, Engagement helps design surveys and slice and dice the results by filters (such as department, gender and performance score) as well as benchmarks. Currently, the company targets organizations with under 1,000 employees. Enterprise-level companies have a different set of needs that Lattice has yet to focus on, Altman said. “One of the areas that got us to thinking about this was through a lot of data that we saw both in Gallup polls and our customer studies that people realized retention was a huge factor in the way they were thinking about their people and HR practices,” Altman told us. “There’s all sorts of different areas that drive satisfaction, retention and engagement and productivity but they hadn’t been pulled together.” The more his team studied the issue, the more “intrinsically apparent” it became that engagement and performance were closely connected.